Selah Marley doesn’t know where her inner drive comes from — not really, anyway. She hears the whispers — from friends, family and the media — about how much she’s accomplished in her 18 years. All she knows is something inside her fuels her to go harder, do more … go faster. Her parents, Lauryn Hill and Rohan Marley, know where that drive comes from, no question about that. It was there since day one. Indeed, Selah Marley has a lot going for her, and it doesn’t hurt that her mom is the infamous L. Boogie Hill and her grandfather, Bob Marley, is an icon in every nook and cranny of the world. And maybe that’s something else that’s making her go so hard. Her modeling resume, thus far, warrants a raised eyebrow. She’s worked with Chanel, Calvin Klein, Kanye West’s Yeezy Season presentation and Beyonce’s Ivy Park, and she broke Twitter earlier this month when she landed the April cover of the U.K. Sunday Times style magazine. “Honestly … I feel like I’ve done a lot, but I still feel like I have a long way to go,” said Marley, who grew up in Miami, Los Angeles and South Orange, New Jersey. “I don’t feel like I’ve done enough, honestly. Maybe I’m in a little bit of a rush, and not appreciating enough. But I still feel like I could be doing better. I feel like I need to go a bit more in-depth, showing who I am and stepping out on my own,” Marley continues, her Jersey twang coming through. As a little girl, Marley wanted to be Lauryn Hill. Who wouldn’t? If your mom was the neo-soul legend who killed them softly with her melodic lead voice of The Fugees in the early ’90s, you’d want to be her too. But Marley said that yearning caused some strife, at least internally. No doubt, Hill had made her mark. Following the release of her full-length debut, The Miseducation of Lauryn Hill, the baby-faced Jersey girl was one of 17 black figures on Time magazine’s cover throughout the 1990s (out of 525 covers). Only five — including Bill Cosby, Bill T. Jones, Toni Morrison and Oprah Winfrey — worked in arts and entertainment. Hill was the only musician. She was just 23. “When I do things like model or sing, it’s always, ‘There’s Lauryn’s daughter,’ ” Marley said. “Yes, Lauryn Hill is my mom. When people say that, they’re thinking a certain way — and they’ve already put you in a box, and now I have to fit into your box. It creates a little friction, but I’ve gotten over that. Marley maintains that her mom is her No. 1 fan and partner-in-career. When the calls come in and the offers are made, it’s Hill whose brain gets picked first — usually via text. An admitted phone-aholic whose guilty pleasure is Instagram, Marley just completed her freshman year at New York University, where she is enrolled in the Gallatin School of Individualized Study. She enjoyed the freedom to create her own curriculum, where her studies focused on showing the link between science and spirituality and how all religions connect. 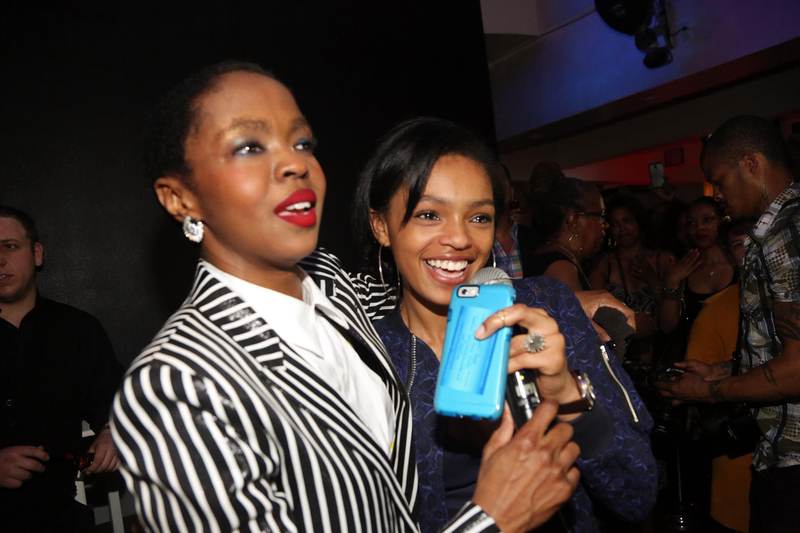 (L-R) Lauryn Hill and her daughter Selah Marley celebrate Lauryn Hill’s birthday at The Ballroom on May 26, 2015, in West Orange, New Jersey. But as her fledgling modeling career gained momentum, it became harder to manage school and career. Her parents, who have five kids together (including Marley), have her back, providing support and love in their own respective ways. From dad, she said, she gets structure and foundation. From mom, she gets compassion and understanding. At the end of 2016, when she was invited to walk the Chanel pre-fall show in Paris, dad called to check in and heard his daughter complain about having to find her own way — and being alone. When dad asked her why she was alone, she admitted that she had missed a flight. At 5 feet, 3 inches tall, Selah, whose name was given to her by her grandmother Rita Marley, worries little about fitting the mold — and is instead working to create her own lane. If you could be any athlete — past or present — who would you be? I think I would be Serena Williams, because she’s done so much. She’s such a powerful woman. I love what she’s done as a black woman in America. I thank her; I appreciate her and I thank her. And she’s dope. You come from a rich musical family. How do you find out about new music, and what do you like? I find out about music from different people. I’ll hear a song, and it’ll catch my ear and I’ll be like, ‘Oooh! I need this song.’ When I heard ‘3005’ by Childish Gambino, I was like, ‘Oh my God! What song is this?’ I OD’d on it. I just fell in love with his music. What’s your favorite Lauryn Hill song, and why? I don’t know all of her Fugees stuff; I know her more as a solo artist. I would say her song ‘I Get Out’ — off her Unplugged album — is the one. Just because that song is so liberating and has such a deep message. It’s just all about freedom. What about your grandfather — Bob Marley? ‘Natural Mystic’ — because it basically speaks of that unseen world. I love ‘Running Away’ because the message is clear: ‘You can run, but you can’t run away from yourself. You can’t hide from yourself.’ And ‘Redemption Song’ just speaks to looking at yourself in the mirror, and forgiveness. What does Undefeated mean to you? Undefeated to me … it’s like chasing your dream and not taking no for an answer. People may pull you down, but you don’t let that take you over. It’s always being able to overcome.